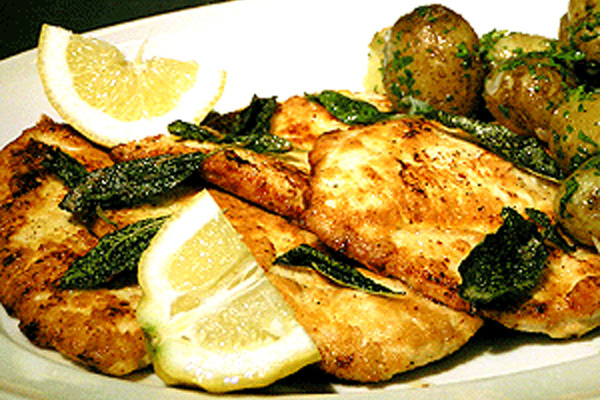 Parmesan Crusted Chicken Breasts – This is one of those things grandma used to cook when we were growing up. It is somehow extremely sophisticated in it’s simplicity. I wouldn’t hesitate to serve this to the most critical guest I know. This is one of those things grandma used to cook when we were growing up. It is somehow extremely sophisticated in it's simplicity. I wouldn't hesitate to serve this to the most critical guest I know. 4 skinless and boneless chicken breasts butterfled and pounded flat. 2 tbsp Parmesan for each egg you use! Trim up the chicken breasts, butterfly them and give them a light pounding to flatten them so they are all the same thickness. In a hot saute or frying pan (non stick if you have it) melt the butter with the olive oil over a medium heat. Toss in a few sage leaves at a time. Fry until they turn a dark green color about 6 seconds and remove to drain on a paper towel. They should be crispy. Dry off the chicken breasts and salt and pepper both sides. Take the 2 eggs and beat them in a small bowl. Add the grated Parmesan cheese and dip each chicken breast in this mixture one at a time and place in the saute pan (see notes below). Saute on a medium heat until golden about 6 minutes on one side and 5 on the other. 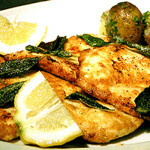 Arrange the chicken breasts on a platter and sprinkle over the fried sage leaves with a wedge of lemon for each person. This recipe is simplicity itself. It can even be served all by itself after a first course of pasta. It is light, distinctive and totally delicious. A couple of things to keep in mind it's great all year round as a light summer dish or with New Potatoes Steamed with Butter, Parsley and Spring Onions for something more substantial. Try and buy really good chicken for this recipe the Parmesan is not going to mask a bit of cheap chicken. If you don't know how to butterfly a chicken breast you can ask your butcher to do this for you. Ask them for 4 breasts which in total will come to about 1/2 kilo, (or 1 lbs.). Purchase good Parmigiano-Reggiano, using the best will help insure great results. I usually use one egg for 2 breasts with 4 msk (or 4 tbls) of grated Parmesan, be a bit generous. It will look a bit strange and clumpy but don't worry it is the way it looks. Don't make the pan too hot or you will burn the cheese before you cook the chicken. Saute it gently for about 5 minutes on each side, the thinness of the breasts will help them to cook quickly. You cannot do this recipe with a whole chicken breast because it will be too thick and you will never get it cooked all the way through without ruining the cheese it is coated in.